One Owner. The SUV is to the 21st century what station wagons were to the 20th, thanks to their do-it-all combination of passenger, cargo and towing capabilities. The 2017 Dodge Durango arguably takes it all a step further, offering the big SUV capability one expects in something like a Chevy Tahoe, but in a smaller package designed to compete against the Honda Pilot, GMC Acadia or Toyota Highlander. The 2017 Durango gets a new model level, with the new monochromatic GT replacing the chrome-laden Limited as the volume model. It all adds to a package that offers an available V8, up to 7,400 pounds of towing capacity, and creature comforts like active cruise control with full stop, and a 10-speaker Beats by Dre audio system. If you're looking for V8 power in your midsize SUV because you want to tow, or if you just want a great-looking V6-powered alternative to the Hondas and Toyotas you see everywhere, the Dodge Durango deserves a look and a test drive. The Durango Limited model disappears in favor of the new, monochromatic 2017 Durango GT. Among the interior upgrades are a hand-wrapped soft-touch instrument panel, and Platinum Chrome interior accents. One particularly clever new feature: viewing trailered items while moving using the 8.4-inch Uconnect screen. Stick with the standard 295-horsepower 3.6-liter V6 engine and 8-speed automatic on the 2017 Durango, and you might be pleasantly surprised. It can haul up to 6,400 pounds, but it's also smooth and refined, and the 8-speed automatic is a good match, even if it occasionally hunts for the right gear. But, let's face it, the real attraction is the 360-horsepower Hemi V8. Not only does it sound great at full throttle, it offers seriously quick acceleration and passing power, plus it can tow up to 7,400 pounds. There's no disguising the Durango's size and weight compared to competitors like the Toyota Highlander, but the rear-wheel drive (RWD) and careful suspension tuning help the Durango feel sportier than you might expect. That goes double for R/T models, which offer a downright stiff ride. Interior noise levels are quite low, and all three seating rows are admirably comfortable. There's no SRT model, but the 2017 Durango R/T comes close. With 360 horsepower from the V8 and a lowered suspension that maximizes grip from the 20-inch wheels and tires, the Durango R/T is one of the most agile SUVs at the price. The Durango's comfortable suspension, roomy interior and excellent audio system beg for a road trip, and its available Adaptive Cruise Control -- part of the Technology Package -- makes it even easier by automatically slowing when needed, and even tightening the gap in slower traffic so you don't get cut off. You'd be forgiven for thinking the 2017 Dodge Durango was in a higher-priced category than its competitors. That goes double for Citadel models with their heated and ventilated front seats, and heated 2nd-row seating. Keep the 2nd-row bench if you need 7-passenger hauling, or opt for the captain's chairs to make the third row more easily accessible if you're using child boosters. There's only so-so cargo space behind the third row, but that row folds flat, and you can even flip the front-passenger seat down to accommodate long objects. New this year is a hand-laid dash pad, and "platinum chrome" trim. In front, the 2017 Dodge Durango boasts LED highlights under the projector-beam headlights, and in back is a cool LED spanning the entire rear end, giving the Durango its signature "racetrack taillight" display. The new GT model replaces the Limited's chrome with a monochromatic theme, but fans of the bright stuff can still opt for the SXT or especially the Citadel. The Blacktop package returns on GT and R/T models, featuring 20-inch gloss-black aluminum-alloy wheels, crosshair grille and Durango badges, along with black headlight bezels. R/T models also get more body-colored trim, as well as the R/T's lower ride height. 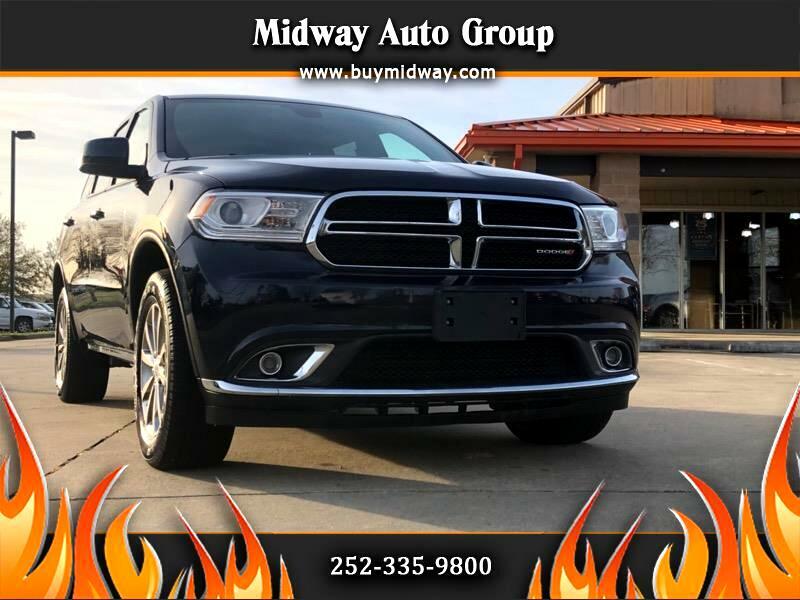 For 2017 the Dodge Durango SXT comes standard with seating for five passengers, the 3.6-liter V6 engine with start/stop technology, and a Sport mode to enhance the driving experience. There's also the standard Uconnect infotainment system with its AM/FM/CD radio, WMA/MP3 support, Bluetooth, Sirius satellite radio and auxiliary input jack. You also get 18-inch aluminum-alloy wheels, fog lights, heated power-side mirrors, and 3-zone automatic climate control, along with a tilt/telescope steering column. Different models have different levels of standard equipment, with the top-line Durango getting a power liftgate and sunroof, navigation, Nappa leather seats, and more. The 2017 Durango seems infinitely customizable, from the optional 3rd-row bench and 2nd-row captain's chairs, to V8 power, 4-wheel drive, and more. Beyond that, there's an upgraded 8.4-inch Uconnect infotainment system with navigation, and an LCD multifunction display between the main gauges. Option packages include the Blacktop package, and a Brass Monkey appearance package that features 20-inch bronze wheels. Other options include a rearview camera, parking sensors, blind-spot monitoring, power sunroof, power hatch and automatic-dimming high beams. If you're going to tow, get the 220-amp alternator, heavy-duty engine oil cooler, Class IV hitch receiver and load-leveling rear shocks. We're big fans of the 3.6-liter V6 that's standard in every 2017 Durango, except the R/T. With 295 horsepower the V6 has no problem accelerating, and the start/stop system helps save a bit of fuel in the process. Of course, there's also the 5.7-liter Hemi V8, with 360 horsepower and towing capacity of 7,400 pounds. It's also relatively fuel-efficient thanks to a fuel-saver mode that seamlessly deactivates four of the eight cylinders when full power is not required. Both engines are mated to a standard 8-speed automatic transmission, and all-wheel drive (AWD) is available across the board. Note that the fuel-saving mode gives the new Durango competitive fuel-economy numbers. Some 2017 models show slightly lower fuel-economy numbers, due to changes in EPA testing.